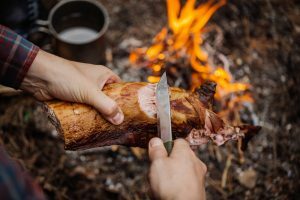 12 Best Survival Knife Reviews 2019 - Pick Your Hunting, Camping Knife! How many knives should it take for you to be able to survive in the backcountry? If you choose the right survival knife, just one. 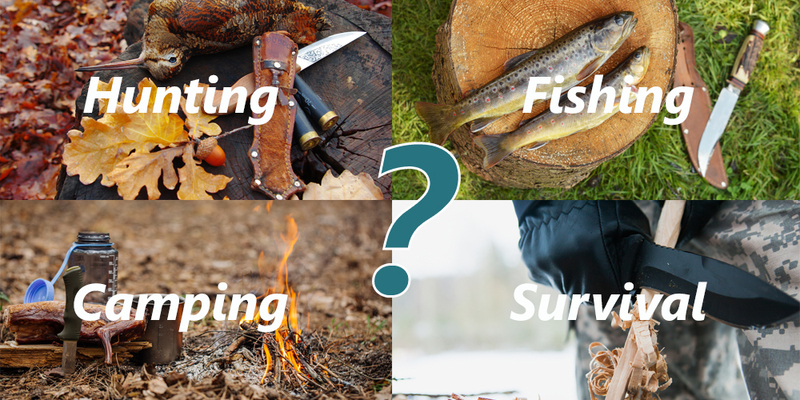 With the renewed hype of survivalism stemming from popular shows such as Naked and Afraid and Bear Grylls’ Man vs. Wild, there has also been a recent influx in demand for survival items. Knives, paracord, first aid, fire starter – have all seen a recent rise in purchases as people have been influenced to build their own survival kits. With so many new products out on the market, it’s hard to choose between different brands. While most first aid and fire starting products work similarly to each other, choosing the correct survival knife could mean the difference between life and death in a survival situation. There are many different factors that go into choosing the best survival knife for you, such as size, function, steel cut, durability, and add-ons that the knife may come with. In this article, we’ll break down the absolute best survival knives of 2017, and hopefully you’ll be able to choose the knife that you could feel comfortable depending on with your life. 1 When Would I Need a Survival Knife? 2 What Makes the Best Survival Knife? 4 Which Unit Should I Choose? When Would I Need a Survival Knife? 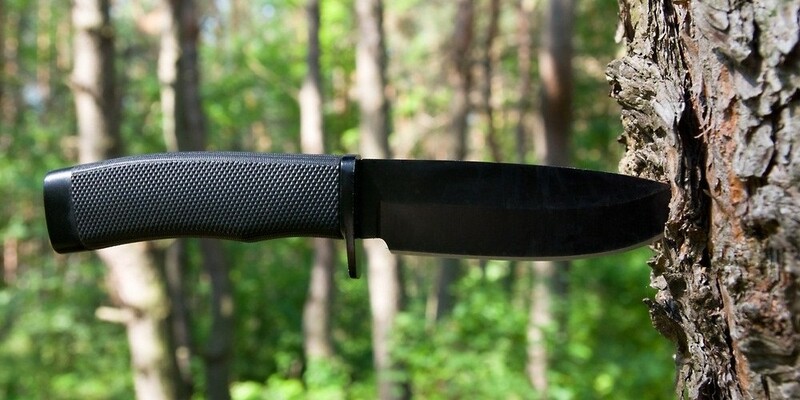 Primarily, survival knives get the most use while outdoors. They are built larger than standard pocket knives, which make them difficult to carry around town (and illegal to carry in most U.S. states). Pocket knives are great for everyday, small applications such as cutting small rope, cutting boxes and envelopes, whittling, etc. We feel that Benchmade makes some of the best pocket knives out there, and we specifically love the Benchmade Griptilian. Survival knives are also vastly different from Swiss Army knives and multitool knives. These small multitools come with a vast selection of other built-in tools, such as flathead and Phillips screwdrivers, pliers, scissors, and bottle openers. While they’re useful for a number of everyday applications, their knives very much lack in stability and durability. If you’re interested in picking up a multitool for everyday use, we definitely recommend any Leatherman multitool, like the Leatherman Sidekick. Now, for people looking past everyday knives into heavy-duty, survival knives, the rest of this is for you. Survival knives are best for those who will use them in outdoors and in survival situations. They need to be durable and versatile enough to cut through a number of different textures and materials, while being easy to handle as well. Specifically, survival knives are great for cutting logs and branches. This is the main application, as it has many purposes – constructing a fire, building a shelter, and building survival tools to name a few. Survival knives are also great for setting traps and skinning animals, which makes it a useful tool for hunters and trappers. Most people don’t realize that while survival knives need to be dependable in life-or-death situations, there are many other useful applications for having a survival knife as well. They can carve wood, are great for cutting fresh fruit (just make sure to clean it first), and are also a great point of self-defense against bears and other predatory wildlife. They are able to open cans while camping, be used as a hammer, or help with cutting things for first aid. Overall, survival knives allow for a range of uses, and are a necessary addition to any survivalist, hunter, or hiker’s inventory. Survival knives must be durable, versatile, and serve the purpose you need it to. This purpose will be different for each individual, and only you can choose which knife is best for you depending on what you may need it for. Hikers and backpackers may choose a lightweight folding knife that takes up less weight and space in their pack, but is dependable for making a fire when setting up camp. Alternatively, hunters and trappers may opt for a more heavy-bladed, thick survival knife to skin animals. Some survival knives have different additional features. Hollow handle knives will allow you to store something in the hilt of your knife, such as fire starter, magnesium flint, etc. You can also fasten hollow handle knives to the tip of a rod to make a spear. Other knives have built-in compasses, magnesium fire starters, and so on. 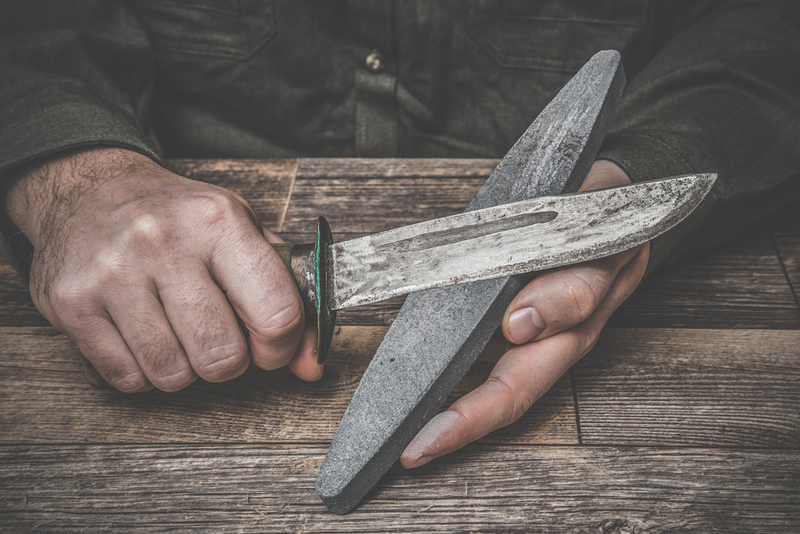 Now, objectively, the best survival knife is going to be constructed of high-quality steel, have a durable hilt with a good strong grip, and will be able to withstand lots of pressure being put on it in many different ways. 1. Steel can be manufactured through a number of different ways and processes, and each process will yield a different result in blade quality. For those interested in the specs of each blade type, we’ve included a couple charts that will explain the hardness, edge retention, wear resistance, and corrosion resistance of each steel type. 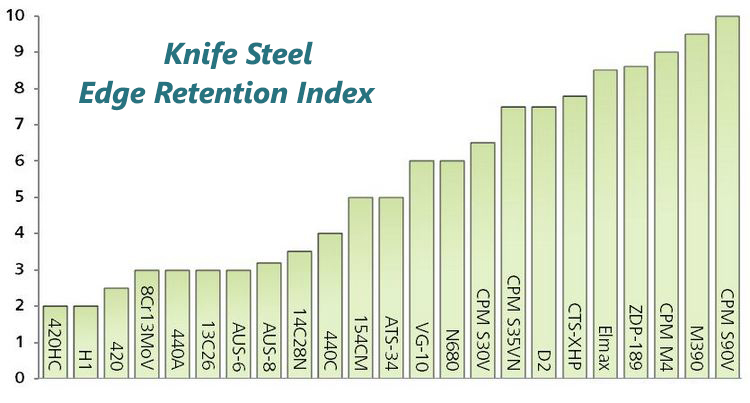 As you can see in the charts, the steel type CPM 110V is one of the best steels in hardness, edge retention, and wear resistance, but is more susceptible to corrosion than other steel types. In order to best determine which knife you’re looking for, it is important to choose one with better steel qualities. When choosing a knife, they will have engraved the type of steel on the side of the blade – this will give quick reference to if it is constructed from good steel or not. 2. The shape of the blade is also an important factor to consider: the correct blade shape will work great for the activities you will use it for; the wrong one would be inefficient for your purposes. 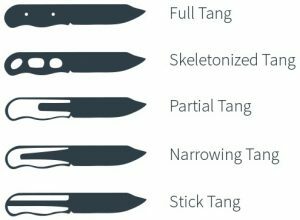 While there are many different knife shapes, we’ll focus on the four main shapes that you’ll see in a survival knife: Clip point, Drop point, Straight-back, and Tanto point. The clip point is a favorite for many larger pocket knives and bowie knives. It curves upward at the last third of the blade, and is good for self-defense and stabbing, as well as skinning game. It may not be the best for multipurpose use, but definitely has its own use for some people. The drop point, by comparison, is much better for cutting and carving, as it tends to be more stable than the clip point. The blade naturally drops off, which gives the spine a thicker and stronger feel. This blade is great for hunting and for chopping wood into smaller twigs and tinder, and probably our favorite style blade, as it serves a number of uses. The straight-back blade is another great shape. With larger blades, you can usually fully put weight on the blade in order to dig into the material better. It’s great for splitting logs and wood, for chopping food and wood, and could be great for starting a fire. The Tanto point has a sharp tip for puncturing and stabbing. They are thicker, and not great for skinning game, but they do make a good survival knife for those looking for a self-defense heavy knife. 3. Tang is another factor to take into consideration before purchasing a knife. The tang of a knife describes how far the blade extends into the knife’s handle. Partial tang means the blade extends partially through the handle, and full tang means the blade runs through the full handle. Blades with a partial tang may become susceptible to wiggling and becoming loose after use, and are less likely to stand up to pressure being put on the knife. Full tang knives are well-balanced, can withstand lots of pressure, but are much more expensive. Overall, there quite a few factors to consider before purchasing the best survival knife for you. Luckily, we’ll break down what we feel are the best 12 survival knives and narrow the choices down for you! While we recommend going with a fixed blade knife over a folding knife for the best results and longevity of the knife, we decided to include our favorite folding survival knives in the list as well. 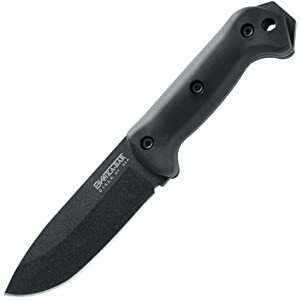 The first survival knife in our list is Cold Steel’s Recon 1. The Recon 1 series includes everything from drop points to tanto points, but our favorite was definitely the clip point knife. It features a 4 inch, 3.5mm thick blade. The grip has G-10 laminated scales which prevent slipping from sweaty palms, and the blade’s tough finish eliminates glare. It features a clip to easily wear the knife on your hip, and has a convenient thumb disc to easily open the knife. The blade is made of imported Japanese AUS 8A steel that has been vacuum heated, which allows for a very form-fitting grip. Overall, this clip point is good for anyone looking for a smaller knife to add to their backpack for smaller hikes, and could be good for opening cans and making smaller tinder as well. If you’re looking for a good smaller knife in addition to a larger survival knife, Ka-Bar makes a very good folding knife that pairs well with any of their heavy duty knives. The blade fits in right under 4 inches, and is pretty comparable to Cold Steel’s Recon 1. Like the Cold Steel folding knife, the Ka-Bar Mule is made outside the U.S. with AUS 8A grade steel. Compared to Cold Steel’s Recon 1, the Mule is heavier in the pocket, but is also more reliable for heavier tasks. While the Cold Steel is more efficient to use, the Mule is just a bit heavier and can take more force and abuse. At a lower price point, we would pick the Ka-Bar Mule for our folding knife. 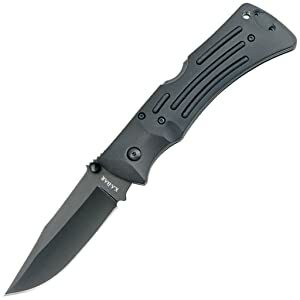 In addition to the fixed blade Mule, Ka-Bar makes a great full tang knife in the Becker BK-22. We recommend the BK-22 over its predecessor, the BK-2, simply because the newest model has a great heavy-duty polyester sheath with a front cargo pocket and blade insert sleeve. The Becker BK-22 is a drop point fixed blade, with a 5.25 inch blade. This knife is best for hunting and camping tasks, such as splintering firewood, killing and skinning game, and chopping food. At a nice price point, we really like this blade for its versatility. The knife handle is meant to fit larger hands, and the grip feels very natural. The SOG Force knife is a force to be reckoned with. The knife has a slim profile, but is a long 6 inches and a clip point fixed blade. The long profile of this knife makes it easy to splinter both larger wood and cut through smaller twigs with the same ease. It is crafted from the same AUS 8 steel as the two folding knives, but has full tang and is almost unbreakable. The handle has a smooth, slim profile made of abrasion and impact resistant, high strength glass-reinforced nylon. It also comes with a lanyard and lanyard loop on the handle. Best of all, this knife is backed by a lifetime warranty against defects in manufacturing. We prefer the straight edge model over the partially serrated model for regular camp activities. The Schrade SCHF9N Fixed Blade is a very good choice for those who want a reliable knife at a low price. It features a drop point blade made of 8Cr13MoV high carbon stainless steel. It also features a textured anti-slip handle with a lanyard loop at the end. The finger grooves allow you to choke on the knife, giving you more force for carving and cutting. The sheath also features a lanyard to which you can tie to your leg, for added stability while wearing on your hip. The blade is a hearty 6.5 inches long, with the whole knife measuring just over a foot in length. It is heavier than other models on our list, weighing a pound, but for anybody looking for a strong, durable knife, we would recommend checking this one out. On the opposite side of the price spectrum from the Schrade Fixed Blade, we have the Fallkniven A1 Survival Knife. The Swedish brand Fallkniven has been designing high-end survival knives and tools for seasoned outdoorsmen since 1984, and has been doing a damn good job at it. The blade is full tang and made of VG10 steel, a very high-end steel that is made to withstand years of stress and hard use. The quality of this knife is surpassed only by its ergonomics. The A1 Survival Knife’s handle has a smooth, natural grip with a lanyard loop at the end. This knife is easy to carry on the hip, and the leather sheath even allows you to carry it upside down. This knife is virtually unaffected by extreme temperatures or rain, and is abrasion resistant as well. The Fallkniven A1’s blade weighs just over 11 ounces with a blade length of over 6.2 inches. As an additional bonus, if you purchase through their website, you can get your knife personally engraved! We heartily recommend this knife, and know that if properly used, it should last for a lifetime. 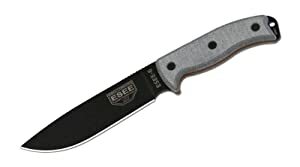 The ESEE 6 Survival Knife series builds upon ESEE’s past award-winning knives, and is one of the better survival knives on the market today. The blade is 6.5 inches long, crafted from 1095 steel, and the handle has a subtly scaled anti-slip texture. The steel and overall production quality of this knife is outstanding, as it is fully manufactured in the U.S. This knife comes in either black steel or grey steel, depending on your preference. If you do opt for the black-coated steel, however, make a note that the coating will impede the knife’s ability to strike a ferro rod with ease. The Micarta handle is very lightweight, ensuring that this knife is a great choice for backpackers or those concerned about weight. While this knife weighs in at just under a pound, it is made from durable, high quality steel, and is a great choice for any backpacker or hiker. 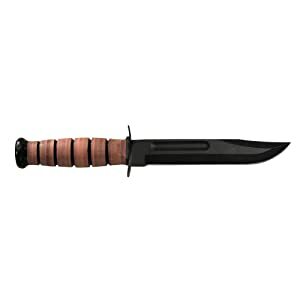 Ka-Bar’s second knife in our list is so popular that it has been used in the U.S. Marine Corps and other U.S. military branches since World War II. Their Full Sized Fighting Knife is made of 1095 Cro-van steel, and is a long 7 inch straight edge blade. As stated before, this clip point knife has been around for at least 70 years, and the company has proudly been in business since 1898. This knife is a great sign of pride for U.S. members of service, and has a great aesthetic that could function as a mantelpiece just as well as it functions in the field. This knife is manufactured in the U.S., and has become one of the most recognizable knife designs in the world. The leather sheath ensures that the knife will be protected, and the knife features a gold-plated brass guard and pommel. 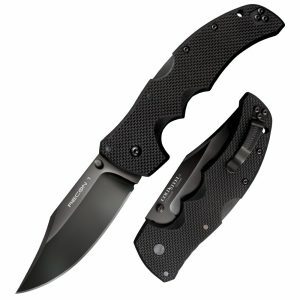 Overall, this knife would be a great gift to anyone serving in the U.S. military, or for those who love the aesthetic of the knife just as much as its functionality. Easily the most popular newcomer on our list, the Gerber Bear Grylls Ultimate Pro Survival Knife is the product of Gerber’s partnership with survivalist Bear Grylls. 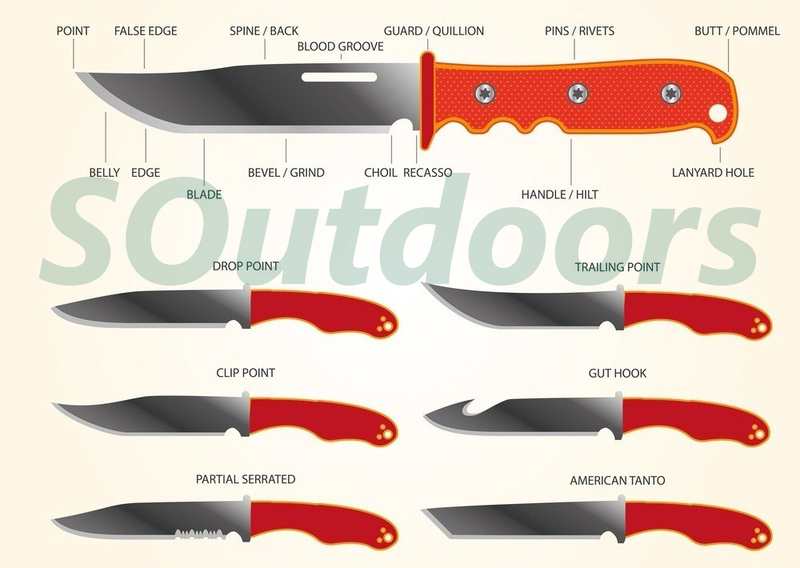 They set out to create a knife that Bear Grylls would use, and feature lots of perks that make it enticing to the average backpacker, camper, hunter, and outdoorsman. 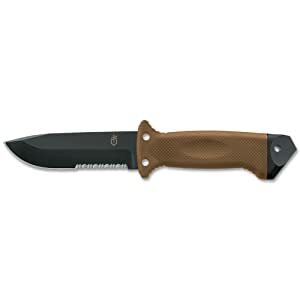 At a low price point, this knife features a 4.75 inch blade with a half serrated edge, a textured rubber handle grip, and a military grade nylon sheath. The Ultimate Pro is a classic drop point blade and retains an edge very well. It weighs 11.2 ounces, has 2 holes at the hilt of the knife to fasten to a rod as a fishing spear, and comes with extra features that make this a great all-in-one survivalist package. It comes with a ferro rod built-in for starting a fire, the base of the handle features a steel pommel for hammering, and it includes a whistle lanyard in case of emergencies. The sheath includes a “Priorities of Survival” pocket guide that one can read in case of emergency. Some people have problems with the manufacturing quality of it, saying it breaks down quicker than other knives in our list. Ultimately, for the features and low price, we definitely suggest this all-in-one survival knife, while noting that it may not be quite as durable as some of the other well-manufactured knives in our list. Buck knives have become so popular that the Buck name has become synonymous with its own product – such as Sharpie and Scotch tape have become synonymous with their respective products. The Buck Hoodlum is a modern masterpiece for the durability and well thought-out design that came from renowned survivalist Ron Hood. At 15.5 inches with a 10 inch blade, this is by far the longest knife in our list. It weighs 22 ounces, it is still easy to carry, but probably not the best for backpackers or those looking to keep the weight of their packs at a minimal level. This knife is made of 5160 Alloy Steel with a powder coating for added corrosion resistance. The sheath comes with a leg strap, and is easy to unsheath, while still remaining secure on the hip. Because of the length of this blade, it can serve a number of uses, including chopping larger wood, protection, and food prep while outdoors. This knife is unique in that it has a notch halfway up the spine for both cutting wire and grabbing the bail on a pot. Overall, we really love this knife for both its quality and ease of use for multiple activities. Benchmade’s Bushcrafter 162 Fixed Blade is a powerful knife that with great perks. Its blade comes in just under 4.5 inches, and is made of CPM-S30V premium American steel. It weighs 7.72 ounces, one of the lightest fully fixed blades on our list, making it great for backpackers and campers. The handle is G10 crafted and is physically resistant to water, abrasion, while still retaining strength and a low weight. The blade is full tang, and from long personal use, I can confidently say it works extremely well. The leather sheath comes with a belt clip, and can be held easily at the hip. Best of all, Benchmade offers once-a-year laser resharpening for all Benchmade knives – FOR FREE, FOR LIFE. This means that even through hard use and wear, you can send your knife to Benchmade’s Oregon-based factory and return your knife to its factory sharpness. This perk alone makes this knife an easy sell for us. 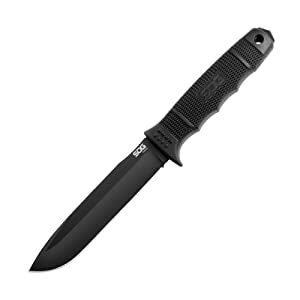 The last knife on our list is Gerber’s LMF II Survival Knife. This is a great knife to pick up for those on a budget, but who still care about steel quality and versatility. 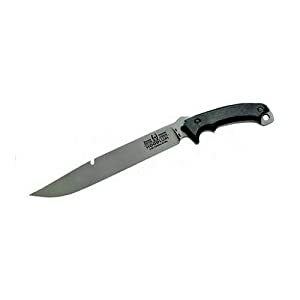 The 4.84 inch blade is constructed from 420HC stainless steel, and its nylon handle is built to absorb shock very well. The sheath comes with a built-in steel sharpener, ensuring that your knife will keep its edge for quite a long time. The blade is half serrated for cutting rope, and the buttcap can break glass, which ensures this knife can be used daily, in addition to backcountry trips. The handle features two holes to convert it into a spear, and a hole at the end for a lanyard. 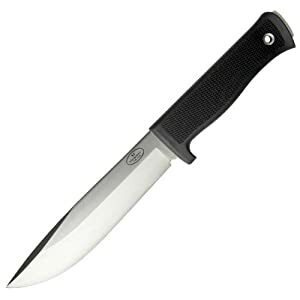 Overall, this knife is strong and durable, and good for multipurpose use. While we don’t care for serrated knives in general, this knife is one of the better ones for those on a budget. So there you have it! We feel that these 12 knives are the best on today’s market, for backpackers, hunters, campers, everyday outdoorsmen, and people interested in survivalism. With so many options on the table, which knife is the best for you? We feel that it comes down to your personal preference, your budget, and what activities you will be using it for. Luckily, we’ll help narrow it down to our favorites in each category. While we think there are some great folding pocket knives out there for daily use, the best day-to-day knife that we would also rely on for survival is the SOG Force Fixed Blade. We recommend the straight edge model over the serrated model, and think that this is the perfect knife for day-to-day use. Its clip point assures that it can be used for daily activity, as well as outdoor activities like chopping wood and smaller tinder. The Ka-Bar Becker BK-22 is our favorite knife for hunting. Its drop point blade ensures that skinning game will be no problem, while its full tang ensures that the steel will not deteriorate or wiggle under strong stress. The knife’s handle is meant to fit larger hands, great for a strong hunter’s grip. Overall, we really enjoy this knife for its versatility that it provides hunters. With the lightest fixed blade in our list and featuring one of the strongest blades, the Benchmade Bushcrafter 162 is perfect for the average backpacker looking to add a survival knife into his or her pack. The handle’s waterproof, abrasion resistant nature and free factory resharpening for life are great perks, but at the end of the day, this knife will add minimal weight to a pack – while remaining a reliable survival tool. The Gerber Bear Grylls Ultimate Pro Knife needs no introduction. It is easily the most popular knife on today’s market, and offers average outdoorsmen and survival enthusiasts many different survival tools, while remaining to stay on a budget. It is not the highest quality of steel, but will do just fine for those looking for an all-encompassing package for cheap. If we could pick one survival knife that could handle any sort of stressful activity and could last for life, we would choose the Fallkniven A1 Survival Knife. It features a large blade over 6 inches, constructed from very strong steel. The handle’s grip is very smooth and natural feeling, and this knife is very easy to sheath and unsheath at a moment’s notice. The A1 Survival Knife is extremely durable under inclement weather and extreme temperatures, and we would feel comfortable in nearly any survival situation with this knife at our side. Now that you’ve narrowed down which survival knife is best for you, it’s pivotal to know how to properly take care of it to ensure that it’ll serve you for years to come. While many of the knives in our list are abrasion and corrosion resistant, with improper use, they could break down quicker than they were intended for. The saying “A dull knife is more dangerous than a sharp knife” is absolutely true. Dull knives can slip off what they are intended to slice through, potentially harming you in the process. Because of this, it is imperative that you continually sharpen your knife between uses. We recommend getting a knife sharpener, or purchasing a knife whose sheath has a built-in sharpener. Another tip: between uses, make sure that your knife is cleaned off of any sap, dirt, or water. If cutting into anything with bacteria (i.e. carcass), make sure to wipe the knife off before putting it back into its sheath. We recommend purchasing a small antimicrobial towel to clean your knife off between uses. This small exercise of cleaning off your knife could make a huge difference in the life of the product down the road. When returning home from a long trip, make sure to rinse the knife off with a bit of soap and warm running water. This will clear it of any lasting bacteria that could eat into the coating of the knife. When cleaning off with water, make sure the blade, handle, and sheath are completely dry before storing it – if there is any moisture, it could lead to rust forming on the blade. Lastly, we recommend storing your knife in a cool, dry place. Also be mindful of the type of sheath you have when storing your knife. This means taking your knife out of your leather sheath periodically in storage, as leather can attract moisture that will eventually do damage to the blade. Whatever survival knife you decide to purchase, you want to be able to depend on it with your life in case of an emergency. Even the cheaper knives on our list can last for a long time if they are properly maintained. We’ve given you the tools to choose the best survival knife for you; now it’s up to you to put your knife to the test! Is there any knife you think we missed? What survival knife would you depend on? Let us know in the comments below! Great article, thanks for the excellent information, helped a lot in figuring out the best option for my needs. One question, though.. There’s a stock image on this page of a knife in a tree. I really like the look of that one, and would love to know the make and model.. Would really appreciate it if someone could help me out with that info! I was wondering the same. Really liked the look of the knife…looks like it would have good ergonomics. I did some searching online and think this may be the same knife. If it is, it’s unfortunate as it seems to be cheaply made. Thanks Dickson, it’s a nice knife! Great article. Love the list of your choice! What a remarkable review! Absolutely fantastic. I appreciate all the information that you have pointed out in your review. Please keep posting more updates. You just can’t go wrong with a Ka Bar Becker 2 or 22. Good choice. Very useful content. Thank you for your content. You’re showing a photo of the Gerber Bear Grylls Ultimate Survival Knife versus the Gerber Bear Grylls Ultimate Pro Survival Knife. Your link to Amazon is directed towards the Gerber Bear Grylls Ultimate Survival Knife. The Gerber Bear Grylls Ultimate Pro Survival Knife has a true full tang, that you can see between the handle scales.. I personally would avoid serrations, but that’s my preference. Agreed. Only because I own one. Also awesome job guys. I make knives as a hobby and now I what types to make my friends and family based off their needs. Thank you! You should have replaced that Bear Gryls with a cold steel srk in sk5. The SOG knife making the list was a shock. What is the knife in the first picture? The black on black drop point with finger guard stuck in the tree. Thanks. You are reproducing the steel charts without consent.